The easy answer to the question is “yes.” Ductless cooling systems can deal with Florida heat just as well as a central system. A ductless mini split is a type of heat pump, and as with standard heat pumps, they operate the same as ACs except they can switch direction and also work as heaters. (Their efficiency in heating mode is one reason they’re ideal for the Florida climate.) 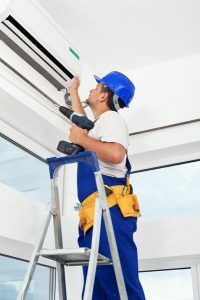 The difference between ductless systems and central ACs is a ductless system sends cooled air through units mounted on the walls rather than through ventilation ducts. The units each have their own blower motor and evaporator coil, cooling off the air and blowing it directly into the space. The units connect to a single outdoor unit via power and refrigerant lines snaked through small holes in the walls behind them. The outdoor unit vents out the heat from the house. Depending on the type of ductless mini split system you have installed, you can have from four to eight different indoor units installed around the house—usually enough to cover all your cooling needs. The only reason a ductless system might not meet your comfort requirements is if it was poorly installed. A system that isn’t properly sized, doesn’t have enough indoor units, or has units incorrectly placed, will deliver substandard performance. As long as you work with local experts like ours, you won’t have to worry about your comfort—either during hot or cold weather! There are many benefits of having a ductless mini split system in your home. But they aren’t right for all homes and situations. We recommend ductless for homes that have difficulty remaining comfortable with conventional central cooling. If parts of the home simply won’t cool down the way you want them too, a ductless installation may be the answer. Ductless is also a fantastic alternative to window units for older homes that lack the space for ducts. If you have plans to remodel your home, ductless gives you more flexibility because you don’t have to worry about ductwork placement. Learn more about ductless heating and cooling: call Touchstone Heating & Air Inc. We’ve served the Communities of North Central Florida since 1998.